Here are the GUIDELINES IN ADOPTING A CHILD IN THE PHILIPPINES. Every couple’s dream is to have a happy complete family in their simple home. Many of them consider adopting a child due to some personal reasons. However, unlike applying for marriage license or processing papers for child records, adopting a child is a tiresome process. Thus, a couple wanting to adopt a child should prepare themselves physically, emotionally and mentally to make sure they can finish the process. 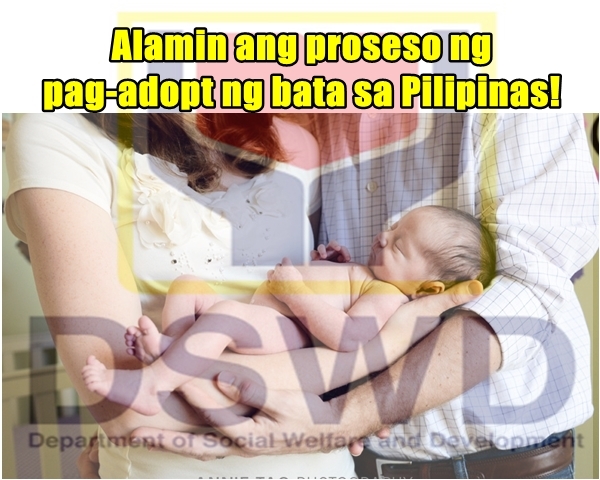 The Department of Social Welfare and Development (DSWD) provided guidelines on how to adopt a child in the Philippines. 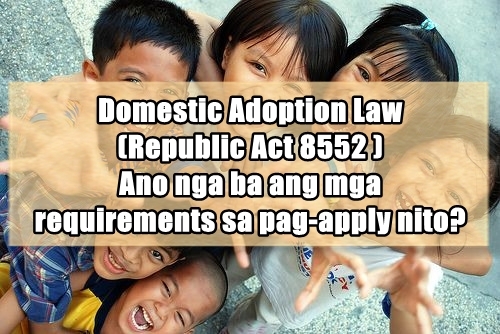 The requirements and directions are according to the Republic Act 8552 known as the Domestic Adoption Law. The following information are based from DSWD's instructions. For inquiries, you may visit their official website: www.dswd.gov.ph. Who are qualified to adopt a child in the Philippines? -The adopter must be of legal age, should be at least sixteen (16) years older than the adoptee, except when the said adopter is the biological parent or spouse of the adoptee’s biological parent. -The adopter must have the capacity to act and undertake all the rights and obligations incident to the exercise of parental authority. -The adopter must be of good moral character and has not been imprisoned of any crime including moral depravity. -The adopter must be in a good position to support, educate and care for the children in keeping with the means of the family. -The adopter must have undergone pre-adoption services. -His/her country has diplomatic relations with the Philippines, has been certified by his/her diplomatic or consular office or any appropriate government agency that he/she has the legal capacity to adopt in his/her country, and that his/her government allows the adoptee to enter his/her country as his/her adopted son/daughter. -He/She has been residing in the Philippines for at least three (3) continuous years prior to the filing of the application for adoption and maintains such residence until the adoption decree is entered. -The requirements on residency and certification of his/her qualification to adopt his/her country may be renounced for the following: former Filipino citizen who seeks to adopt a relative within 4th degree of affinity, one seeking to adopt legitimate child of his/her Filipino spouse, or one who is married to a Filipino citizen and seeks to adopt with his/her spouse a relative within 4th degree of affinity of the Filipino spouse. 3. Guardian with respect to the ward after the termination of the guardianship and clearance of his/her financial accountabilities. -Husband and wife will mutually adopt, except if spouses are legally separated; or if one spouse seeks to adopt the legitimate child of the other; or if one spouse seeks to adopt his/her own illegitimate child provided signified consent by the other spouse. -If they will mutually adopt, or one spouse adopts the illegitimate child of the other, joint parental authority will be exercised by the spouses. Who can be adopted in the Philippines? -Any person below 18 who has been administratively or judicially declared available for adoption. -Legitimate son/ daughter of one spouse by the other spouse. -Illegitimate son/ daughter by a qualified adopter/s to improve his/her status to that of legitimacy. -A person of legal age if, prior to the adoption, said person has been consistently considered and treated by the adopter/s as his/her own child since minority. -A child whose adoption has been previously cancelled. -A child whose biological parent/s has died provided that no proceedings shall be initiated within six (6) months from the time of death of the said parent/s. Whose written consent is required to the Adoption? -The spouse of the person adopting or to be adopted, if any. What are the required documents for adopting the child? -Written authorization to the adoption of the legitimate, adopted, or illegitimate children living with the applicant who are aged ten (10) years old and above. What are the Step-by-Step Process involved in adopting a child? 1.The adopter/s must attend the adoption counseling conducted by the DSWD. 2.The adopter must submit the application requirements to DSWD to start preparation of home study report. The adopter must wait for the approval of the application. 3.If approved, DSWD will facilitate matching or family selection. 4.There will be pre-placement of the child with the prospective adoptive parents. The child will be placed with the adoptive parents when everything is cleared. 5.Supervised trial custody will start to see how the child adjusts to the new environment. 6. If the supervised trial custody is passed, Adoption Decree/ Certificate of Finality will be issued to the family. 7.The amended birth certificate of the adopted child will also be given to the adoptive parents. 8.Provision of post-adoptive services will be offered also by the family. What are the costs involved in adopting a child in the Philippines? The fees and charges involving the adoption may vary depending on applicants who are either former Filipinos or foreigners permanently residing abroad. It is best that you may contact someone who successfully adopted a child and can advise you on this. 2. Newspaper publication of the adoption petition. The total cost for the publication could be as low as Php 7,000 if small-time newspaper or could be as high as Php 50,000 if big-time newspaper. 4. Fees for adoption registration and issuance of amended birth certificate. 5. Required documents which may provide fees like birth certificates, marriage certificate, proof of financial capacity (like ITR, bank deposit, etc), clearances (barangay, police, NBI, fiscal, court), and others as proof of good moral character, good health, etc. For inquiries on domestic adoption, call the DSWD-NCR Adoption Resource and Referral Unit at (632) 734-8622 or 488-2754. For inter-country adoption, call ICAB at (632) 721-9781 or 721-9782, or visit www.icab.gov.ph.